This recipe is from my Fat Witch Bakery cookbook. I love all the recipes in this book, mainly because they are "one-bowl" recipes. Chicken Legs appreciates this fact too, as he is responsible for cleaning the kitchen. 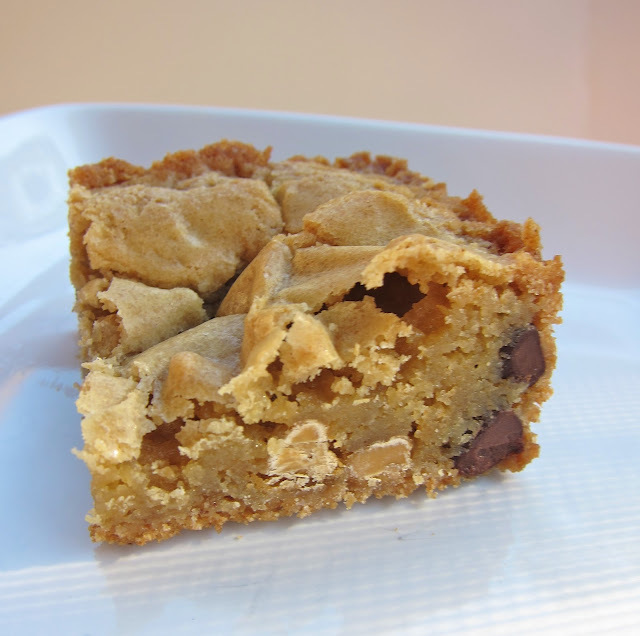 I had such great success with the Original Brownies and Peanut Butter Bars that I decided to give another recipe a try. 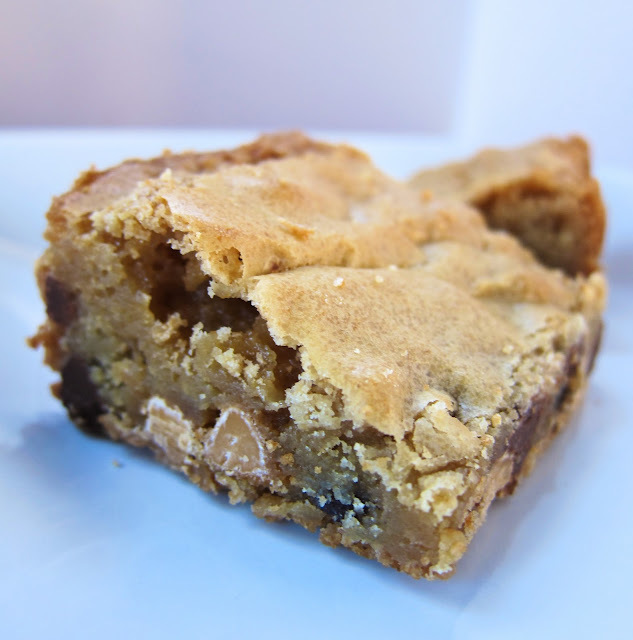 I decided on these butterscotch bars. The bars are very moist and buttery. They were sweet, but not overly sweet. I really liked the combination of butterscotch and chocolate chips - it helped keep the butterscotch from being overwhelming. These bars are especially good when they are slightly warm. I didn't have any ice cream at the house, but I bet it would have been really good on top of one of these butterscotch bars! Preheat oven to 350. Grease and flour a 9x9 baking pan (I use Pam for Baking or Baker's Joy cooking spray). Cream the sugar, eggs, and vanilla in a medium bowl until smooth. Add the cooled butter and mix until well blended. Measure the flour, salt and baking powder and sift directly into the batter. Gently mix the batter until well combined and no traces of flour remain. Stir in the butterscotch and chocolate chips. Spread batter into prepared baking pan. Bake for 20-25 minutes, until a toothpick inserted in the center comes out clean or with crumbs. Cool for 1 hour. Cut into 12 or 16 squares. These look dreamy. Lovely combination of chocolate and butterscotch. These look soooo good! I've made Fat Witch's Snow Witch brownie before and it was super delicious too. Ya'll must be marathon runners to be able to eat all the goodies that you make! Looks good, I'll have to check out that cookbook. These look great! I might have to try them this weekend.